Each Wednesday we’ll answer the on-going question: “What do I wear with these?” It’s a question we get quite often here at the shop and we love giving suggestions when helping our customers. This week we feature the Bed Stu Luz for men. Well hello everybody! This week for What to Wear Wednesday we are featuring the Bed Stu “Luz” for men. A sharp looking yet comfortable basic for any guy’s wardrobe. 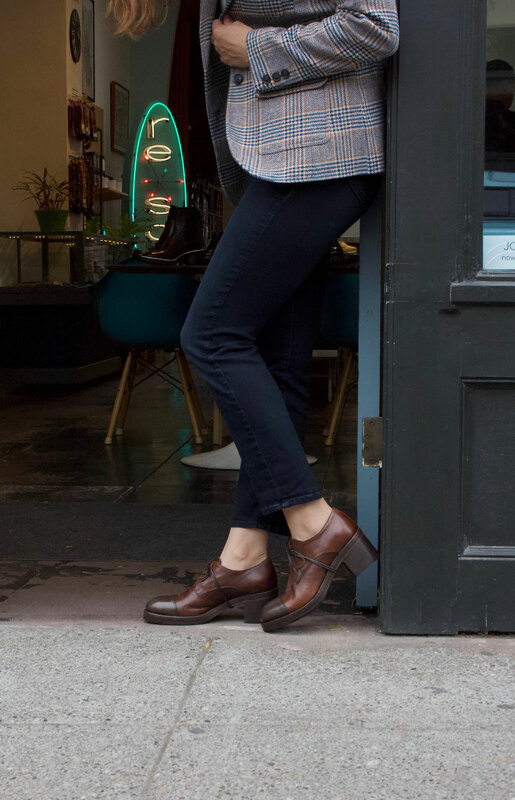 This everyday saddle shoe would fit right in with men’s khakis, jeans or wool pants.Wear them with a colorblock cardigan, a tweed sports coat or a classic gray flannel top coat. Don’t forget to finish your handsome look with a fedora or some colorful socks. > Bed Stu saddle oxford with gray washed leather upper and rubber crepe sole. > Aunts and Uncles “Lucky Loser” bag in vintage coffee. > J Fold “Havana” wallet in brown leather. > Stance mismatched/matched “Slowlane” socks.